Patients with Neurological and Musculoskeletal issues commonly present with decreased strength, proprioception and kinesthetic awareness deficiencies or edema. These and other factors add to the challenges of maintaining the upper or lower extremity properly and comfortably on the device during exercise. BioStep™ 2 is supported by a collection of stabilization accessories to allow patients with these challenges to enjoy the benefits of exercise. 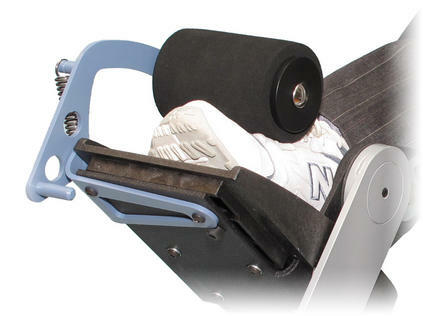 For lower extremity stabilization, we offer a padded foot restraint and pivoting calf support. This combination provides support to the calf while allowing the patient to exercise and experience the smooth BioStep motion. The calf support pivots, allowing the ankle to move as it would naturally in gait. 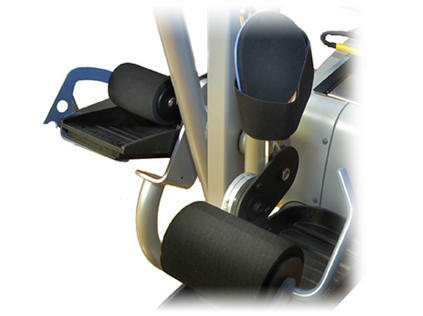 The padded foot restraint is a convenient and comfortable means to secure the foot to the footplate, thereby maintaining correct loading of the joints and postural alignment during exercise. Patients with hand and wrist limitations will find comfort with the articulating hand grips and security of maintaining stable hand position throughout the exercise session. The Hand/Wrist Cuffs allow users with limited or no hand strength or control to enjoy the benefits of the BioStep's upper body exercise.